Rottweilers are calm and not highly excitable. They are also self assured and confident. They tend to have a “wait and see” attitude meaning they don’t tend make friends with people immediately, but must check out the person or situation on their own time. Around their families they are loyal, affectionate and make great companions. 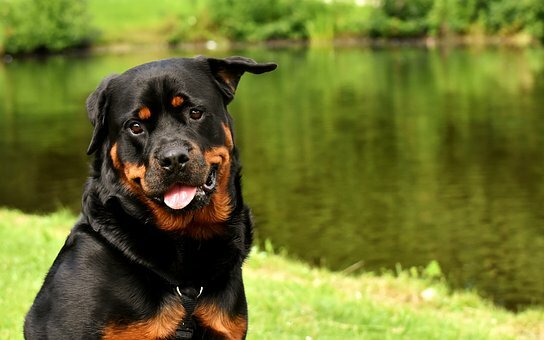 Rottweilers were originally bred for guarding and protection work, and therefore they do best in a family that can train them and keep them busy with a job to do. If bored they can become nuisance barkers and can also become destructive. They shed a lot, but their coat required only minor grooming to keep it smooth and shiny. They are not a suitable breed for first time dog owners, as they require firm and consistent training and discipline. Proper socialization is absolutely necessary with this breed. Aggression in Rottweilers can be a problem if they are not socialized properly. They do require daily physical and mental exercise. Daily walks, play sessions, obedience and agility classes are all activities to do with your Rottweiler. Both pure-bred and mixed-breed dogs have varying incidences of health problems that may be either influenced by genetics or environmental factors. Here are some health concerns that more commonly affect the Rottweiler. Von Willebrand’s disease is the most common inherited bleeding disorder and affects quite a few dog breeds, including the Rottweilers. Unfortunately, cancer and more specifically lymphoma can be common in Rotweilers. When lymphocytes become cancerous within a lymph node, the node will swell and harden. This type of cancer is very aggressive, and even with chemotherapy treatments the survival time is very limited.